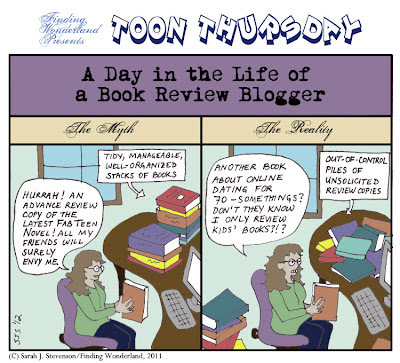 Finding Wonderland: The WritingYA Weblog (archive): Toon Thursday: Box Up Those Books! 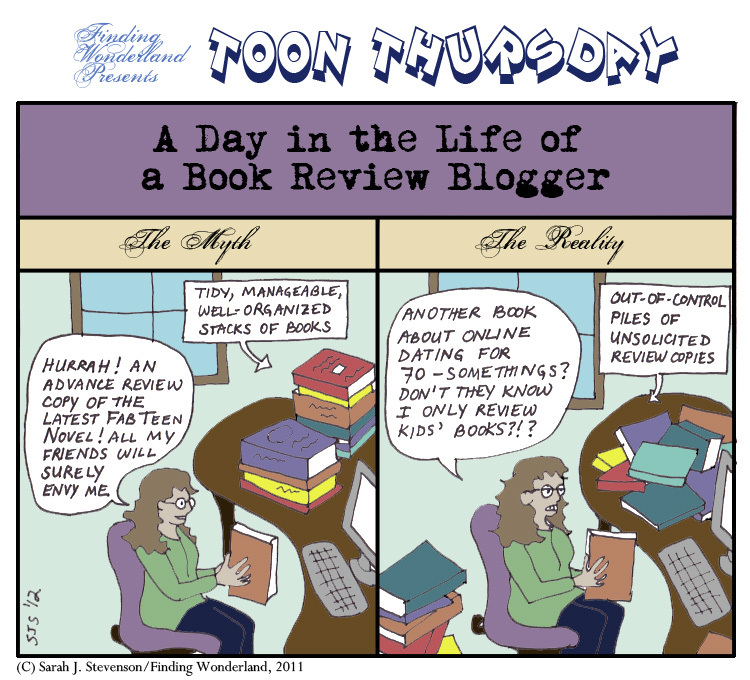 Toon Thursday: Box Up Those Books! As always, click the cartoon to view it larger. Yeah, I know--there probably ARE some lucky bloggers out there whose lives look more like the "Myth" side of that cartoon. And I'll admit the number of wildly inappropriate unsolicited review copies has declined greatly in number over the years (nor have I ever received a book on geriatric cyberdating). But really, MY office looks more like the one on the right. And, if you're like me, you wonder what the heck you can do with all those books. Well, yesterday we featured a call to action for tornado-devastated Henryville's school libraries. And today, in honor of this year's Share a Story - Shape a Future tour (with fab logo at right designed by the lovely Elizabeth Dulemba), I've got a guest post over on Terry Doherty's Family Bookshelf telling the story behind the collaborative resource site Reach a Reader, which I put together just about a year ago with the help of Terry and several other wonderful kidlitosphere friends. The inspiration for the project? You'll have to read the post to find out, but rest assured it definitely has something to do with cleaning out all those review copies! You'll also find out how to locate places to donate YOUR out-of-control book piles, so that you, too, can share a story and shape a future. Oh, interesting stuff - good to know about Reach A Reader. Readers, I Have Finished Grave Mercy.